I can't believe that it will be February on Sunday. 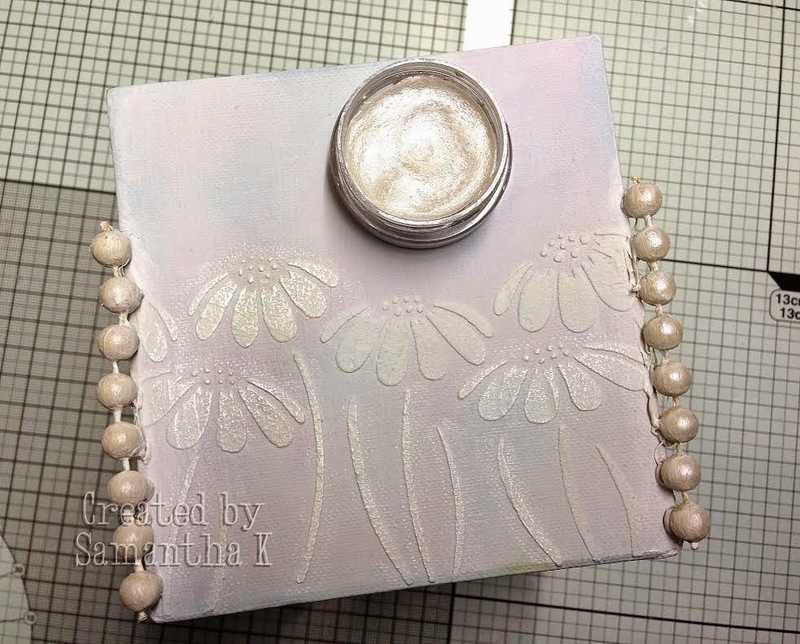 Today we have a beautiful altered mirror tutorial by Amy. Amy will now talk through her tutorial with you. 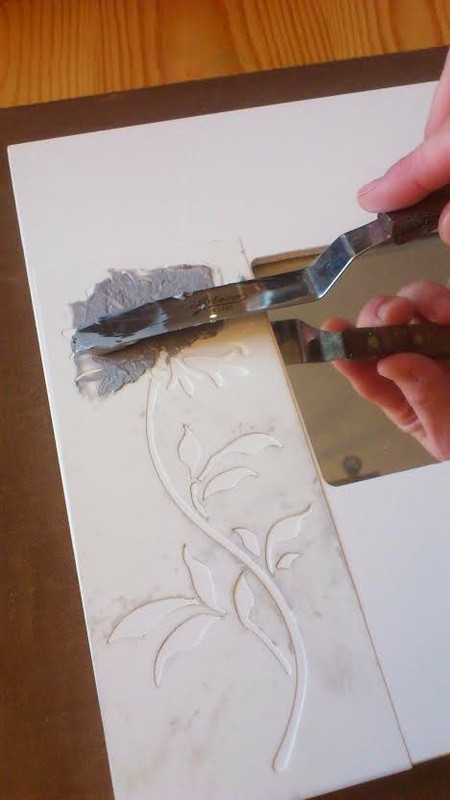 As soon as I saw this panel stencil, I knew it would fit perfectly on the IKEA mirror I'd bought ages ago sat waiting in my craft stash to be altered. 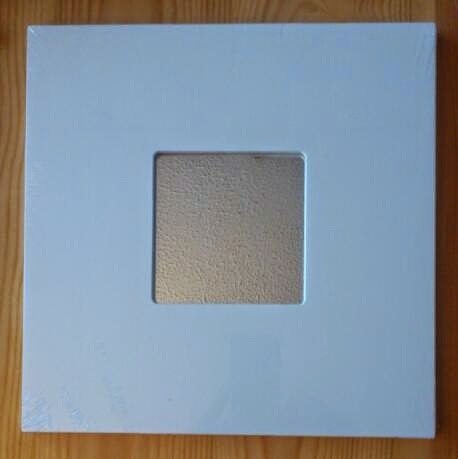 First I gave the mirror a coat of white gesso. 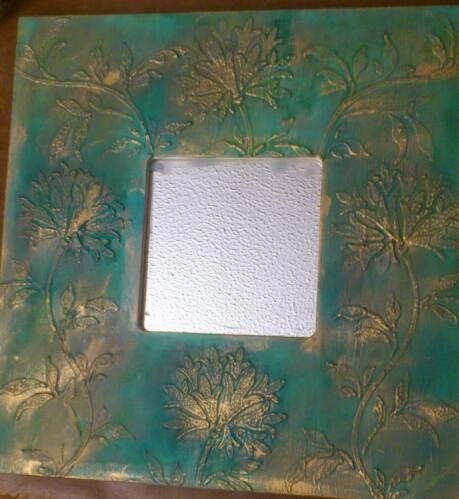 I reversed the stencil & repeated the technique on the opposite side panel of the frame. 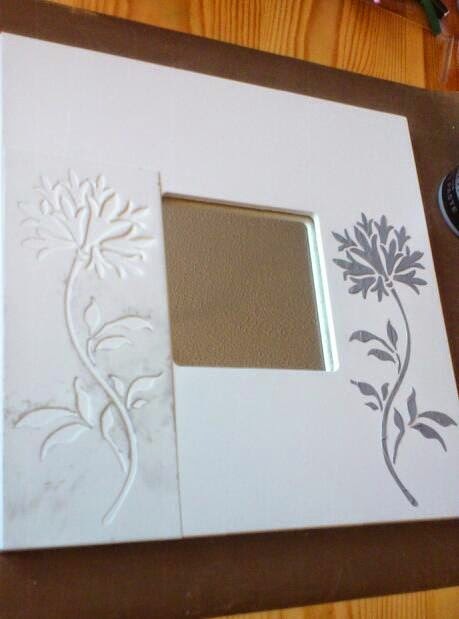 I continued to do this until the design was all over the mirror, masking & allowing drying time in between. 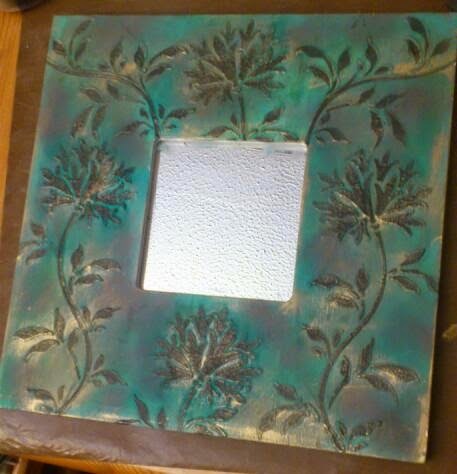 Next I added a coat of gesso followed by 2 coats of turquoise acrylic paint. 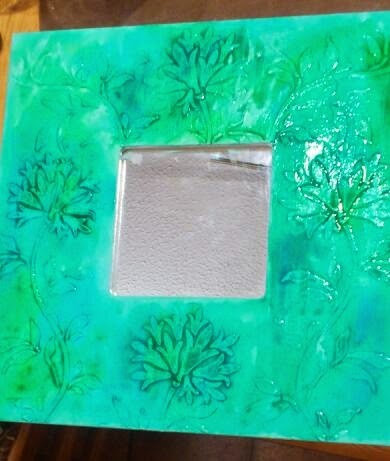 I squeezed a small amount of both gooseberry fool & blueberry ice inkadinks onto my craft mat & added a bit of water then applied it as a wash all over the mirror with a brush. I carefully heated the embossed areas with my heat tool to allow the paste to bubble slightly to add a bit of texture & also to dry the inkadinks. 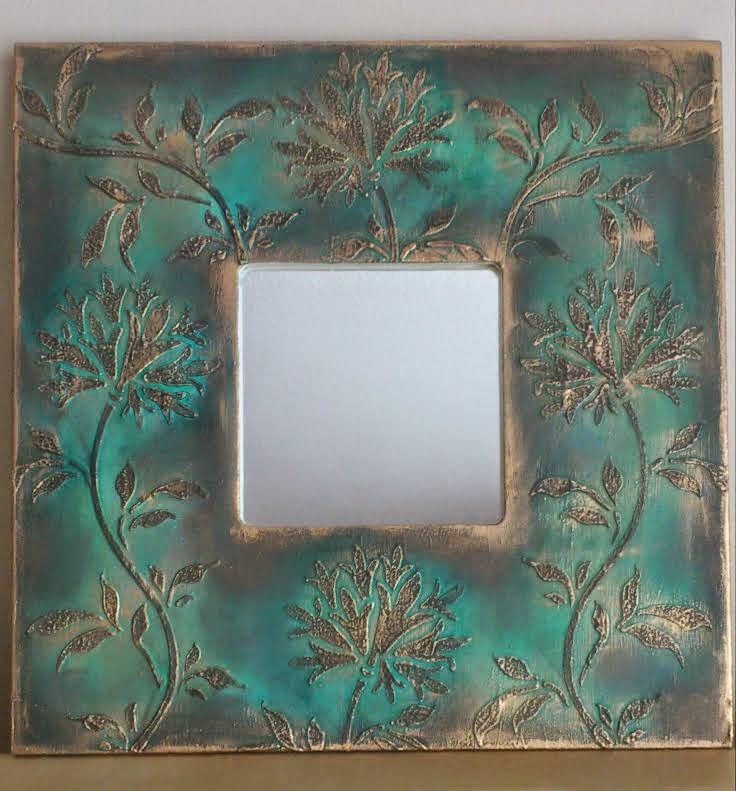 I blended brown ink & black soot distress ink in random areas on the mirror frame & then replaced the stencil & applied black soot to the embossed flowers & leaves. 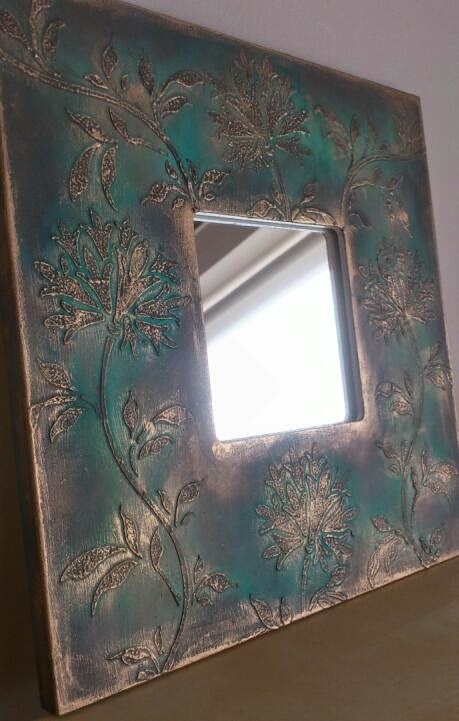 Finally, I applied gold gilding wax, lightly at first with my finger, & then I concentrated the wax on the flowers, leaves & edges of the mirror. That's it, ready to hang on the wall!. Today our tutorial is all about recycling! 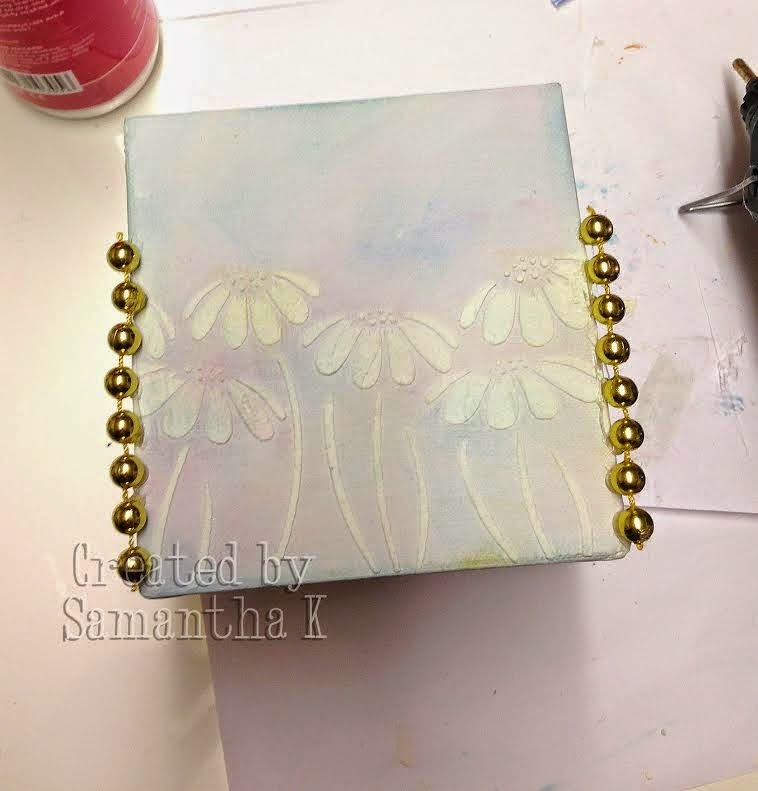 Samantha K has decorated a box from her stash. 2. 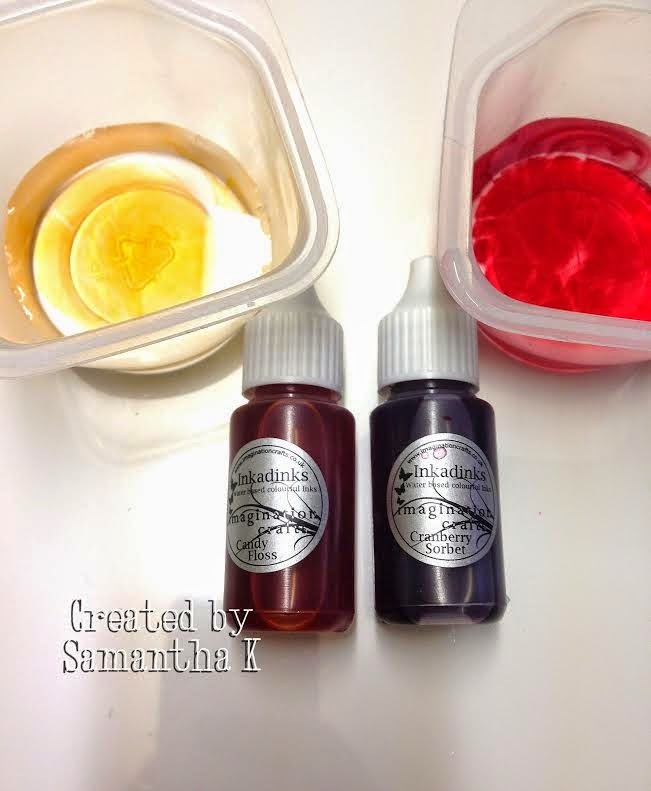 Take your choice of Inkadinks and add each colour to a separate small amount of water. This creates a wash in your pick of colours. 3. 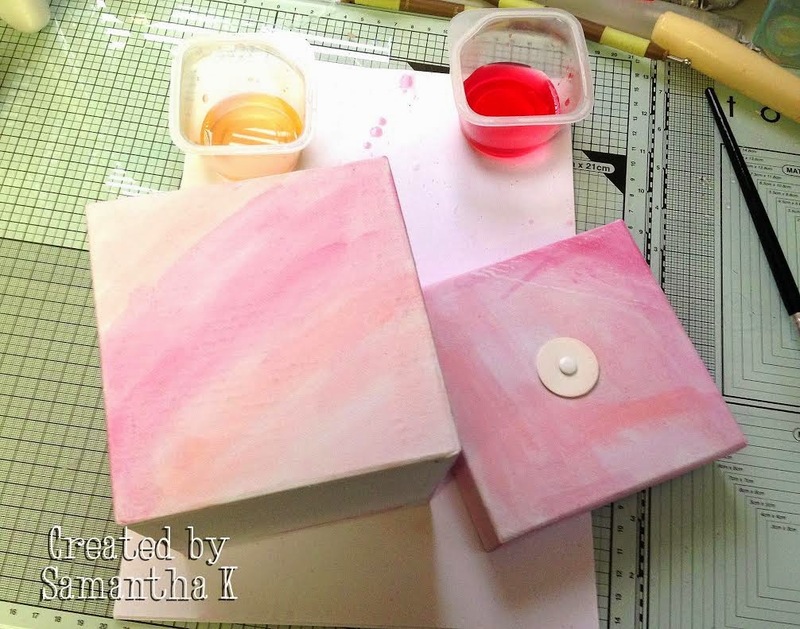 Use the wash to randomly paint your box, until all areas are covered. 4. 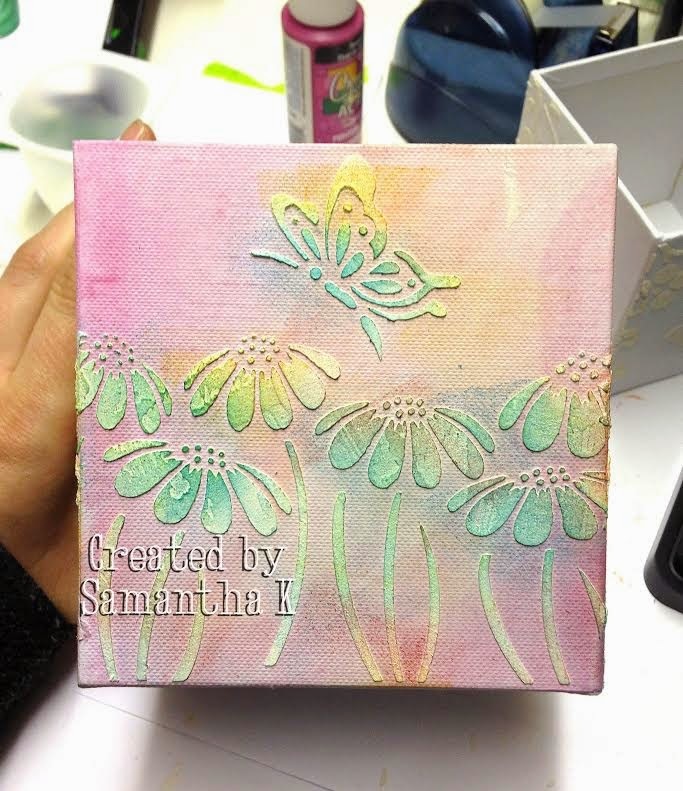 Using your imagination crafts stencil and your texture paste, stencil through with the texture paste to leave the now raised image on your box. 5. Complete all sides and leave to dry. 6. 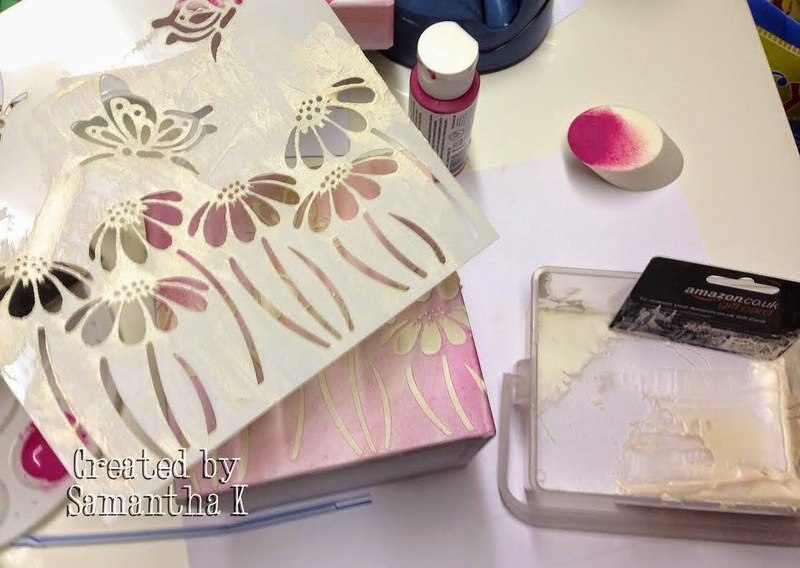 Once dry take your distress inks and use them to highlight/colour the texture paste. 7. 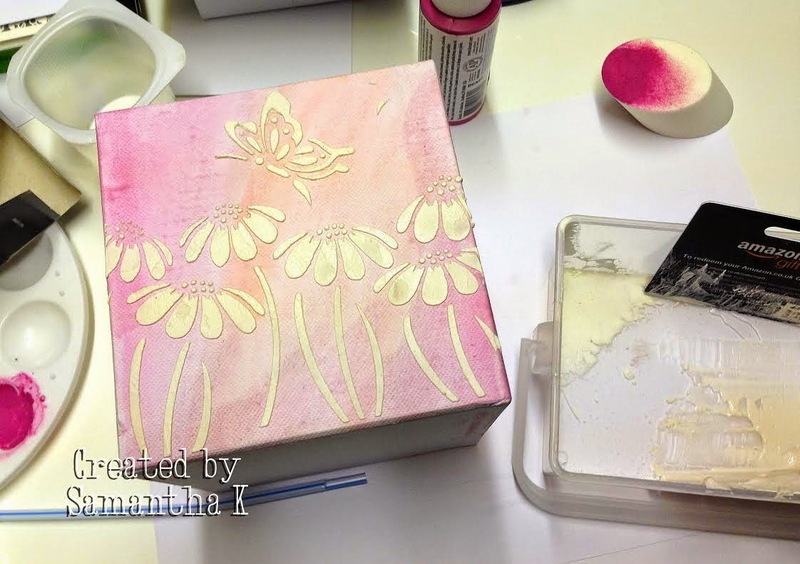 Use the same stencil on the lid of the box and stamp through with your acrylic paint, mine was a bit brighter than expected and so i tried to dull it down a little by stencilling some white over the top. 8. 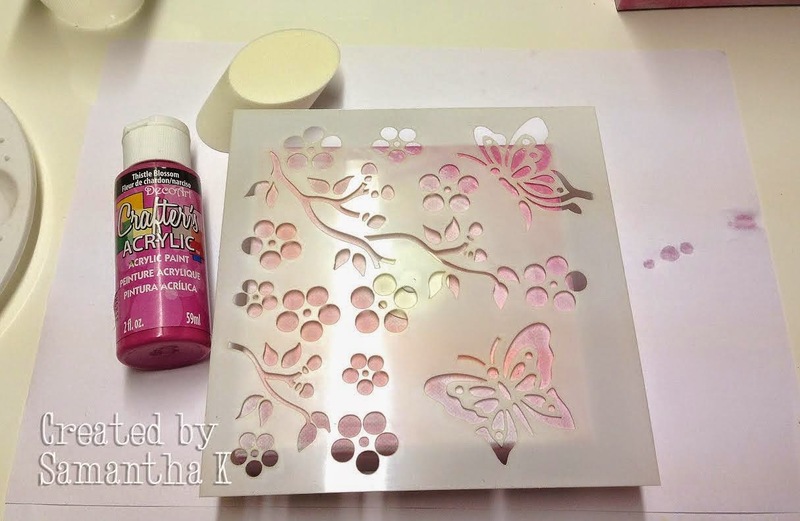 Use your texture paste to stencil on random pieces, i used the butterflies. Then colour these once dried with your distress ink. 9. 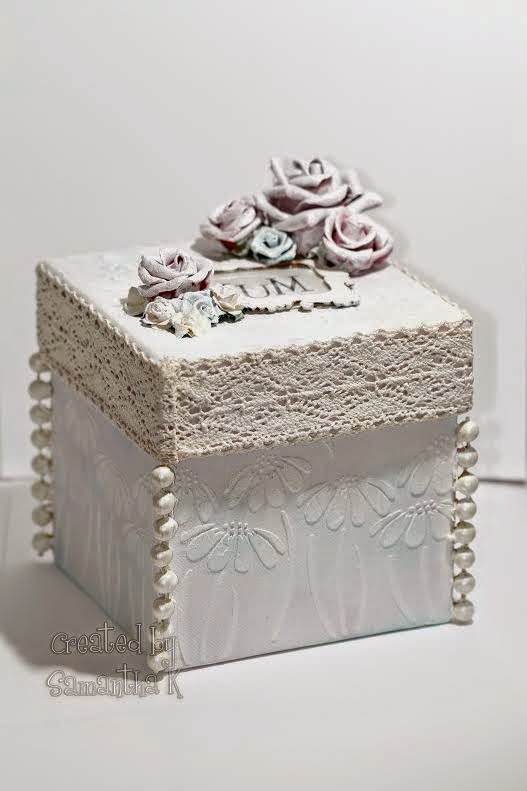 Start to coat your box and lid with an acrylic paint wash, adjust the thickness of the paint with water to suit the thickness you want it to go on. Let it dry. 10. 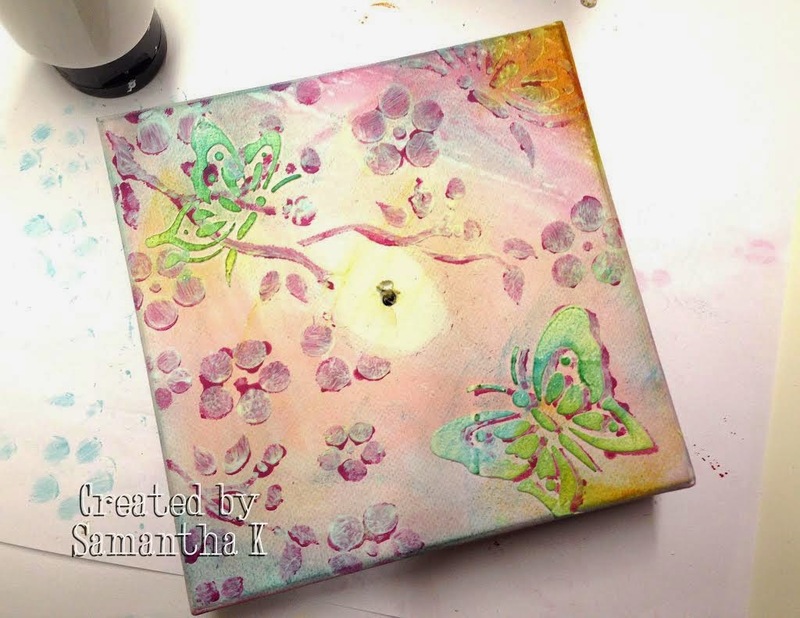 Take your bead decoration and attach it with hot glue or another strong adhesive. 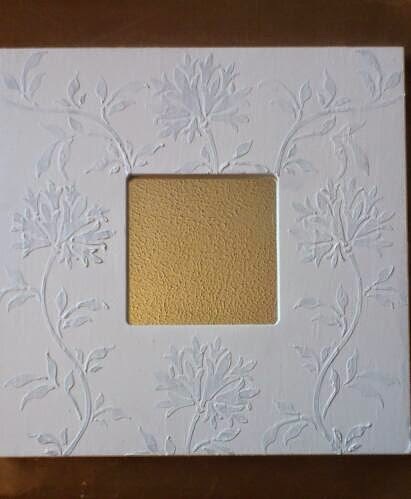 Then paint over this with undiluted acrylic white paint. 11. 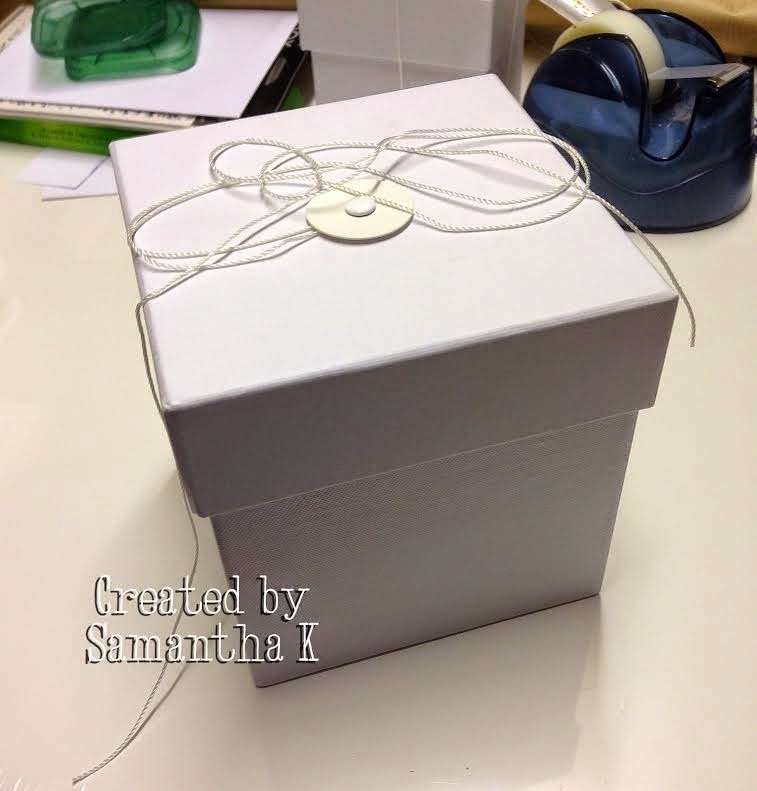 Take your frame and a sentiment of choice and using the acetate as a window, position and fix to your lid. Take the lace trim and adhere around lid edge. 12. 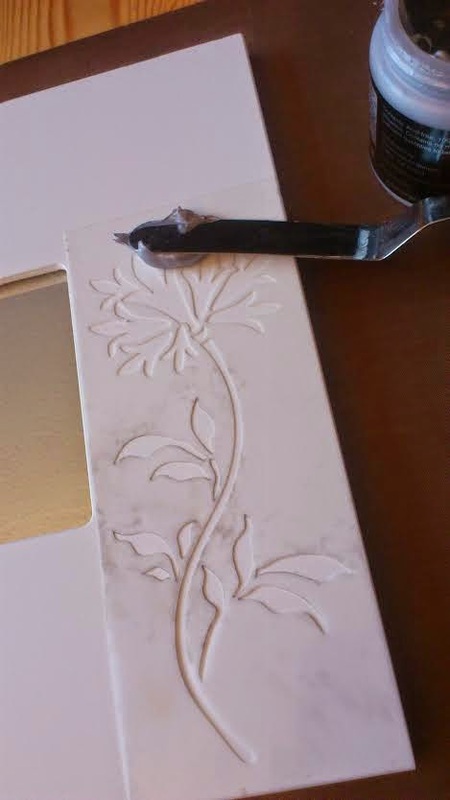 Attach your flowers around your frame with a strong glue. Coat in white acrylic paint (including the lace). 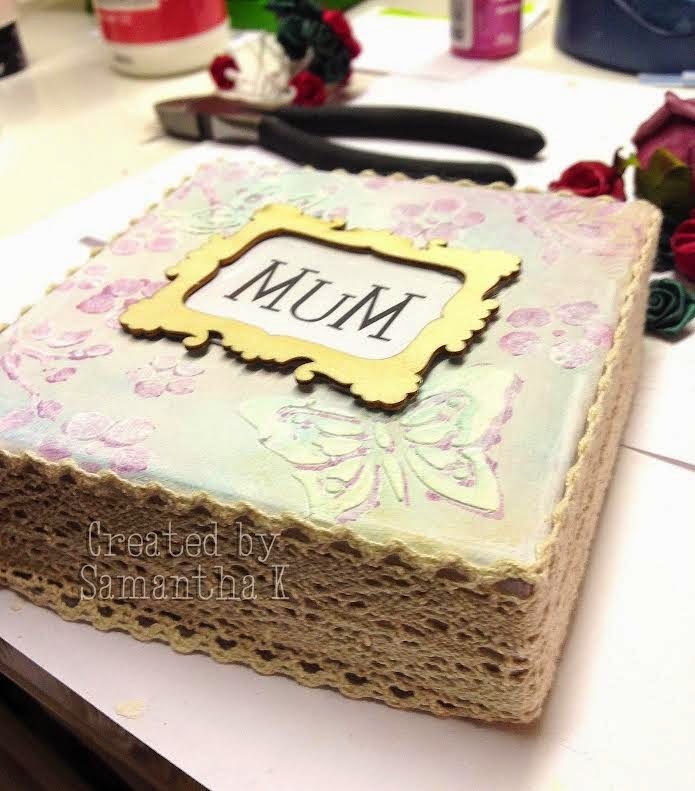 Re-paint any areas of flowers or box that need re-painting, trying to leave a little of the colour all over showing through. 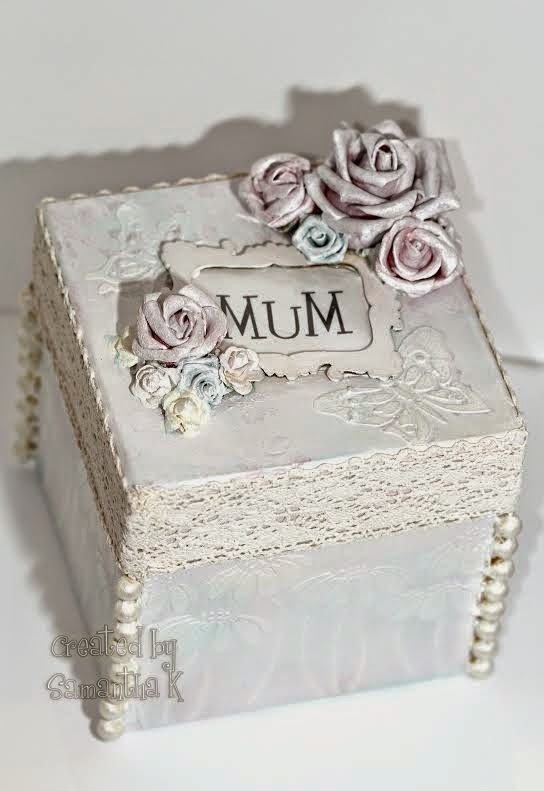 (Alternatively you can make it all very white and then use sprays etc to add your colour, this option though is a great way for those that do not have sprays, but still want to have a bit of colour showing through. 13. 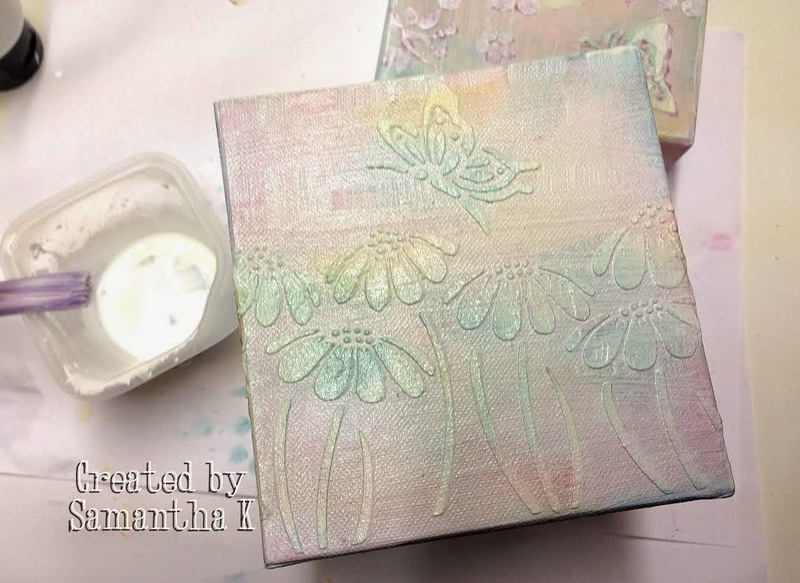 Using your gilding wax, gently rub over the textured/raised areas and the beads. 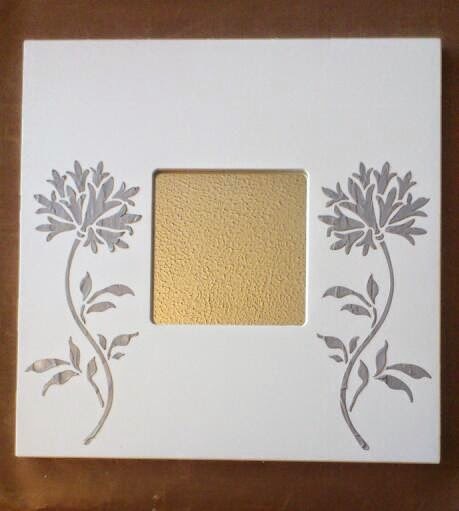 This gives it all a glorious shimmer and really catches the light. (Hard to see in the photos). 14. Buff it all off and you should be left with something similar to this. 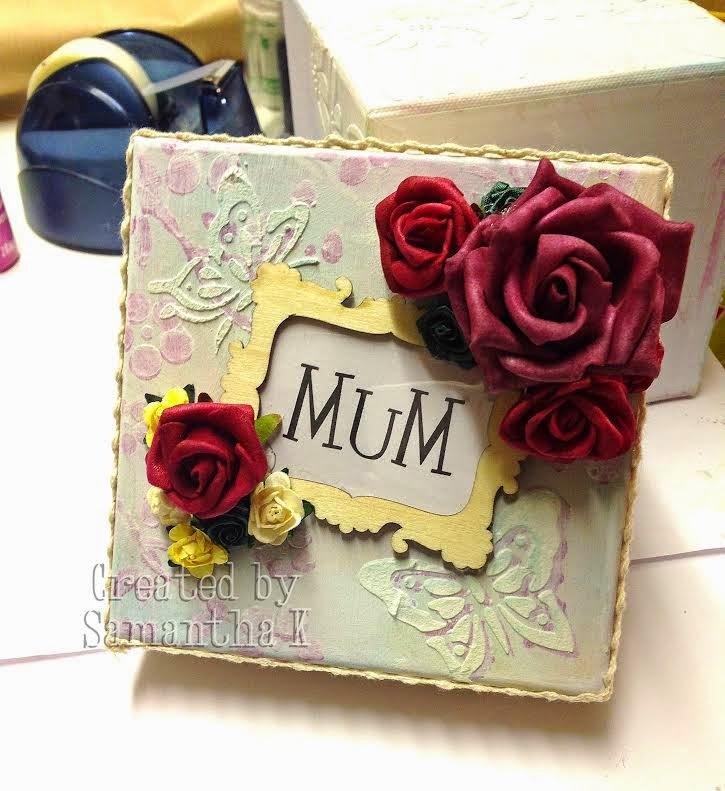 Won't this make a lovely gift for a mum on Mother's Day?